Some of my oldest friends call me "Hot Rod." No, I’m not all that into cars. It's a sarcastic reference to the fact that I tend to do things... very... very... slowly. I like to stroll rather than stride. I'm always the last one to finish eating (unless my dad’s around). And I'm chronically late. If you're reading this, there's a good chance you've been stuck waiting for me -- you might be waiting right now! -- or will be eventually. For that I'm sorry! And so, I guess unsurprisingly, it’s taken me about six years to record a new batch of songs. Six years?! Yeah, I couldn’t believe it’s been that long either. (WTF, time? Why the relentless marching?) But anyway, I think it was worth the wait! I present to you my new full-band EP, The Things You Keep – produced by my friend Will Dailey (and featuring a number of his band mates, The Rivals). It’s available for download right now on Bandcamp, where you can preview it for free, and you should see it on iTunes, Spotify, Amazon.com, and the other big digital outlets within a few days. Since this is the 25th century or whatever – and also because it costs a ton of money to press CDs and we still have several hundred copies of Indeed! in our basement – The Things You Keep is a digital-only release. However, if you long for the days of physical media (I don’t blame you), send me an email, and for five bucks I’ll burn you a copy and print out the art and everything. I’m really happy with the way these songs turned out. "Story of New Orleans" absolutely came to life with a band. And it's exciting to think that "On and On," the song I sang to Gina at our wedding, could now be part of someone else's big day. But what about you? Take a listen and let me know what you think! Update: Due to popular demand from sentimental types like myself, physical copies of the CD are now available for $5.99. 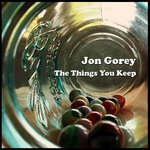 And here's where you can find "The Things You Keep" on iTunes. Are those fondue pots on the wallpaper? 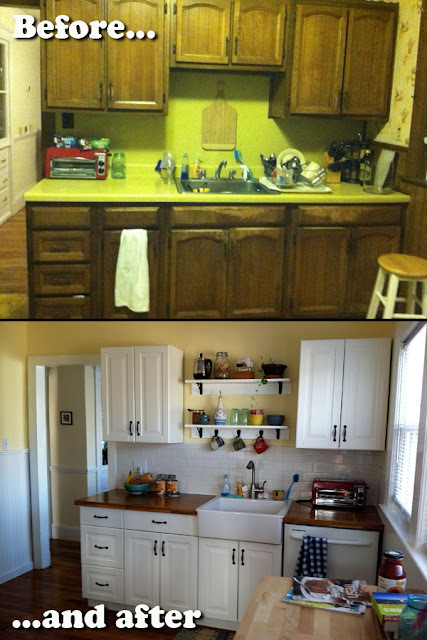 We've been planning to do a kitchen makeover for a long time now -- since the moment we bought our house three years ago, in fact. But we kept putting it off, partly because everyone says you should wait to see how you use the room -- it will tell you what it needs and what it doesn't as you live in it -- and partly because, well, we knew it would require a daunting amount of both hard work and money. And oh my, did it ever. It's true, though, what they say about discovering what the room really needs. Our early, more ambitious plans were pretty much scrapped in favor of keeping the layout almost as is... we found it actually worked quite well for us. (Of course, cost also played a role in the decision.) What's even weirder is that we started growing accustomed to -- almost fond of -- the garish, muddy yellows of our ca. 1974 wallpaper, wood paneling, and linoleum. 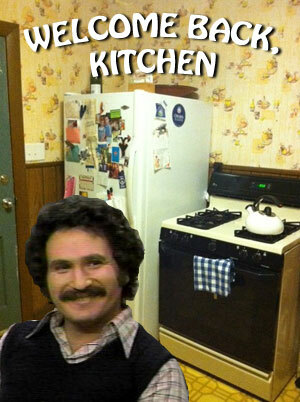 So in case you're curious, or would one day like to do a budget makeover of your own Kotter-era kitchen, here's how it went down. Yesterday I spent a full 12-hour day recording a batch of new songs with out-of-my-league musicians at Q Division -- where rock goddesses such as Kay Hanley have recorded masterpieces -- courtesy of my friend and musical godfather Will Dailey. I use the term "new" rather loosely, since some of these songs have been kicking around since 2006 -- like the one I played to Gina at our wedding, nearly four (!) years ago. But there are a couple of brand new ones, too -- and, I gotta say, they're sounding damned good! Cut to the chase, man! So the point is, I'll have a new 6-song EP coming your way in a few months' time. Maybe more, maybe less -- it all depends on how our kitchen remodeling goes down. When you're 35, leaky sinks don't give a crap about your rock-star dreams! This also means it's time to clear out some old inventory -- by which I mean the 1,200-some-odd copies of Indeed! stacked up in our basement. You can now buy the CD or download individual tracks at a nice discount from CD Baby, or click the old 'Buy Now' button to your right and I'll send you a copy myself for a measly 5 bucks (including shipping!). I will of course post some preview tracks once they're ready. For now, feel free to rock out like it's 2004.
top 5 of all time. Last night we saw Weezer play at the BofA Pavillion, and they were terrific. They played no fewer than 8 songs off the Blue Album -- and only one off Pinkerton, which I like better -- but that’s why we caught their front-to-back Pinkerton show in December. It actually worked out pretty well! Anyway, they closed the main set with the last song on the Blue Album, “Only in Dreams.” It’s a moody song, and, despite its throttling crescendo, not something you’d ordinarily end the night with. Still, after the band ducks offstage into the dark, you gotta clap for the encore, right? Show your appreciation? Well, some people argue not. My friend, whom we’ll call ‘Jeff,’ didn’t bother to hoot and holler, saying, “They’re going to come back out anyway, what’s the difference?” It’s a prevalent belief. Plenty of people just stood there gaping up at the stage, checking their phones or half-heartedly clapping once a minute as they wait for the predetermined encore. As someone who’s spent plenty of time on both sides of the stage, as a musician and a fan, it bothers the hell out of me. Yes, a national touring act will have its encore(s) planned out in advance. Unless the whole crowd starts heading to the exits en masse, the band will come back out 99% of the time, and play the same encore set they played in Baltimore four nights ago. But do you want them to come back out because they HAVE to, or because they WANT to?